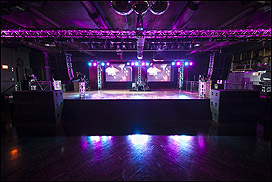 CHICAGO (CelebrityAccess MediaWire) — Chicago's newest venue, the Concord Music Hall, cast open their doors for the first time on July 25th. Located between Chicago's Wicker Park and Logan Square neighborhoods, the venue has an adjustable capacity, ranging from 700 to 1600 and hopes to fill a void between Chicago's music clubs and some of the city's larger venues in attracting national touring artists. Backed by Riot Fest, Silver Wrapper, and React Presents, three leading indie promoters in the Chicago market, the venue will host a broad range of artists and music, from punk to electronic, indie to hip-hop, funk to metal, jazz to jam bands, and everything in between. The fall calendar for the venue is already filling up and features a list of artists that includes AlunaGeorge (Live), Capital Cities and Passion Pit DJ sets, Jimmy Cliff, Lotus, Netsky, Laidback Luke, Jason Isbell, EOTO, Lettuce, Dumpstaphunk, Boys Noize, Less Than Jake, Misfits, Lotus, DJ Bl3nd, and official after parties from North Coast Music Festival and Riot Fest.